WageLoch is a committed and proud supporter of education, support and awareness of Autism Spectrum Disorder in Australia. At present, it is estimated that 1 in every 68 children are diagnosed on the Autism Spectrum. 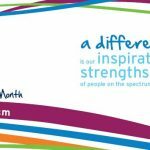 To mark Autism Awareness Month in Australia, WageLoch has chosen to make a donation to Aspect Schools, to assist in the resourcing and education of children on the Autism Spectrum. Previous PostDon’t be a “bunny” with Easter rates and rostersNext PostHow much time is wasted fixing a payroll error?